What we have here is a true Molten Metal Band in the form of Power Metal. 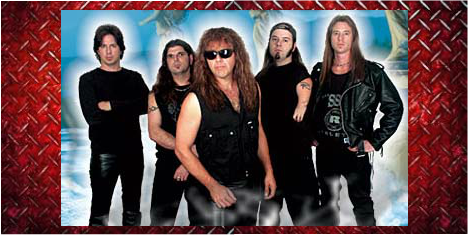 This band delivers the Metal goods with high intensity and quality of production. This is very technical melodic music which can be listened to over and over again without getting old to the ears. Robert "Rob" Rock is an American Heavy Metal singer-songwriter from Orlando,Florida, and has released five albums as a solo artist, which all are classic Metal Slabs of pure Power and they are as follows: 2000-"Rage of Creation" , 2003-"Eyes Of Eternity" , 2005-"Holy Hell" , 2007-"Garden of Chaos," ," and 2009-"The Voice of Melodic Metal." Rob Rocks singing style blends perfectly with the music as he flawlessly reaches the high note whenever he likes. It must be said that there's not many in the industry with the voice control that Rob has. On Rob's projects, he likes to incorporate duo shredding that hits hard and fast and is sure to get the fist pumping. The guitar work will leave you begging for more with blistering guitar solos that are more than amazing. One thing that has helped add to this area of success for Rob Rock is that he has always surrounded himself with guitar virtuosos. Some of these guitar extraordinairies are big names like Chris Impellitteri, Roy Z(Iron Maiden,Judas Priest,Driver,Warrior), and Carl Johan Grimmark(Narnia,Divinefire,Saviour Machine) just to mention a few. If your going to be a successful Metal band then you have to have a good guitarist or two right? For some, Rob Rock is best known as the longtime frontman of Impellitteri, a position he has held from 1987 to 1988, and from 1992 to 2000, and now from 2008 to their present day 2009 release of "Wicked Maiden." Chris Impellitteri's band is simply called "Impellitteri." Rob also sings lead for a band called Driver and currently has two releases which are "Sons of Thunder" and "Countdown." We can only hope that Rob Rock will keep putting out albums and encouraging "The Metal Breed". Other bands with Rob Rock as lead singer are Joshua, Impellitteri, Driver, Warrior-The Code of life, Fires of Babylon, Angelica-Angelica. Rob did one song just for you guys who love Thrash like me and it's called "You Know" off the "Eyes of Eternity" album. Who can condemn us with justification? (See Site Info for Sword Scale Meaning)This rating is for the album 'Eyes Of Eternity'. If you love Power Metal like I do then you don't want to overlook any of Rob Rock's work because it's some of the best in the Christian industry.